distribution Mainly found in the Piedmont and the adjacent southwestern Coastal Plain, but finally found in the mountains -- in 2011 in Madison and Buncombe counties, and in Graham County in 2014. (Range maps in references tend to show the western 60-80% of the state within the range, and Paulson  even shows the entire state within the range). Likely occurs in the western Piedmont, where disturbingly lacking of records south and southwest of Yadkin County. abundance Rare to locally uncommon in the central and eastern portions of the Piedmont. Rare in the Coastal Plain portion of the range, and obviously rare and local in the lower elevations of the mountains and in the western Piedmont. flight The flight in the Piedmont occurs between late May and mid-October, with the Coastal Plain flight slightly narrower in time -- about late June to late September. The mountain records fall in a narrow window between early July and early August, though the flight period there is certainly wider, and likely extends into September. habitat Generally rivers and wide streams, especially with riffles and somewhat fast flow. behavior Normally stays very close to rivers and streams; occasionally strays to open fields, jeep roads, etc., well away from flowing waters. Perches on low vegetation, banks, or rocks along shores of rivers and streams. comments Until a few years ago, there were very few recent records for this "widespread" species. However, in the past several years there have been numerous records from the Neuse River just below the Falls Lake dam, and a handful of records from Buncombe and Madison counties, mainly not far from the French Broad River. Mike Turner expanded the range eastward to Edgecombe County in summer 2017. 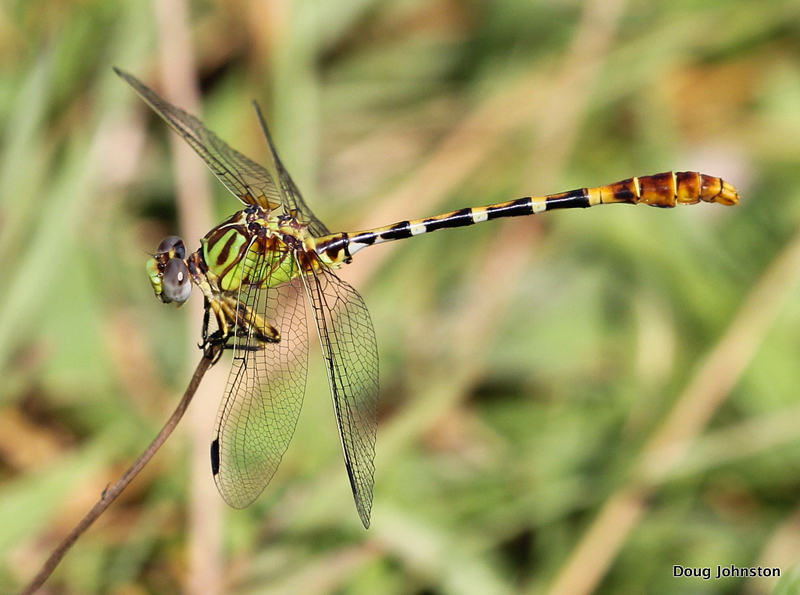 This is one of the more "colorful" of the clubtails, and for that reason, it may be the easiest clubtail in the state to identify.